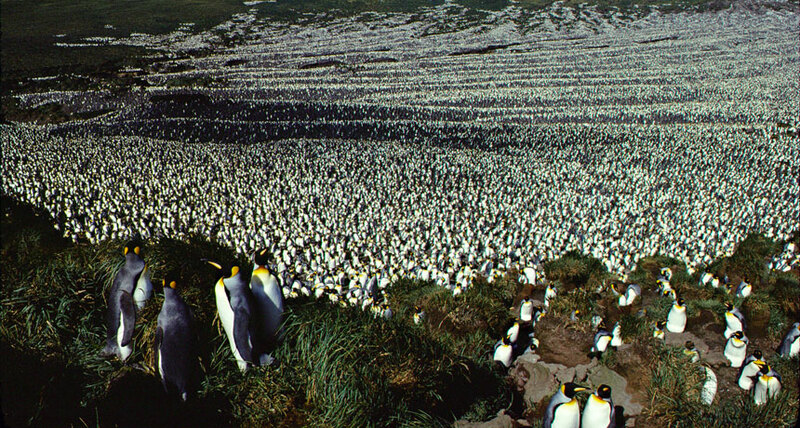 WHEN KINGS RULED The largest colony of king penguins (shown in 1982) once had some 500,000 pairs of breeding birds a season, but recently discovered losses are so big they could affect the species' total population. In its glory days, an island called Ile aux Cochons in the southern Indian Ocean ranked as the largest colony of king penguins. Satellite data suggest numbers peaked at around 500,000 breeding pairs amidst a total of 2 million birds in the 1980s, says seabird specialist Henri Weimerskirch based at University of La Rochelle with CNRS, the French national research service. A 2015 satellite analysis and a 2016 helicopter survey, however, respectively showed only 77,000 and 51,000 breeding pairs on the island, Weimerskirch and colleagues report in the August Antarctic Science. The International Union for Conservation of Nature ranks king penguins in the category of least concern for risk of extinction. That may change, Weimerskirch says, "since the species has lost nearly one third of its population." The second tallest penguins after the emperors, Aptendodytes patagonicus can densely pack themselves into the breeding space with about two per square meter. The panorama of so many birds once was "breathtaking," Weimerskirch says, with underlying ridges in the terrain creating the illusion of waves in a sea of penguins. Four other king penguin colonies have followed different population trajectories, shrinking during tough weather in 1997 but recovering and stabilizing, Weimerskirch says. Whatever's wrong on Ile aux Cochons is probably specific to it, he says. Possible causes include density effects that prevented recovery from a weather crisis, invasive cats, diseases or parasites. But researchers - who haven't checked out the penguin population in person since 1982 - need to visit to solve the mystery of the penguin population plunge, Weimerskirch says.